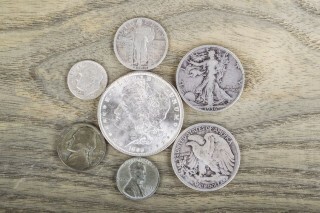 ​Coin collectors throughout the United States and around the world love American silver coins. There are many reasons such diverse individuals enjoy collecting United States silver coins. From the beauty of the designs to the universal familiarity of classic U.S. silver type coins, there is plenty to love about United States silver coins. Coin collectors who want to assemble a collection of silver coins representing the most famous U.S. silver issues have a wide variety of coins they can choose from. If there was an affordable, defining U.S. silver coin collection, what coins should it include? Here's a list of the coins I think every U.S. silver coin collection should include. Surely you might disagree on the selections, so please chime in and share your thoughts on the most important coins to include in an affordable U.S. silver collection! Prices below correspond to the general market when the bullion value of silver is at or below $20 per ounce. Mercury Dime – The Mercury dime, otherwise known as the Winged Liberty Head dime, was minted from 1916 through 1945 and was designed by Adolph A. Weinman. The Mercury dime widely circulated into the early 1960s, when silver prices increased and the United States Mint subsequently stopped production of circulating 90 percent silver coinage, causing mass hoarding silver coins such as Mercury dimes. Mercury dimes are widely recognizable and are generally quite affordable, with most latter dates obtainable in circulated grades for less than $10. Seated Liberty coinage – Christian Gobrecht was one of the more prolific United States Mint Chief Engravers, having designed the Seated Liberty motif that graced the half dime, dime, quarter, half dollar, and dollar for much of the 19th century. Furthermore, Gobrecht's Seated Liberty design was essentially replicated on the 20 cent piece and loosely emulated on the Trade dollar, too. While most collectors pursue the type by collecting one example of each denomination, just one Seated Liberty coin is adequate for representing the type in a silver coin collection. Well-worn, common-date Seated Liberty half dimes and dimes can be obtained for less than $20. Barber coinage – The Liberty Head ("Barber") dime, quarter, and half dollar obverse by United States Mint Chief Engraver Charles E. Barber received tepid welcomes in 1892 upon their debut, but they have garnered much more support in recent decades by coin collectors. The Liberty Head style, similar to that of the 5 Franc French coin of the same period, was seen on the half dollar through 1915 and the dime and quarter until 1916. This design is now regarded as a classic U.S. type and one that should be represented in any U.S. silver coin collection. Common-date Barber dimes, the generally least expensive of the three Barber denominations, are obtainable for less than $10 each in well-worn grades. Walking Liberty half dollar – Widely considered one of the most beautiful silver coins in the world, the Walking Liberty half dollar is beloved by coin collectors from all over. It was designed by Adolph A. Weinman, who also designed the Mercury dime, the Walking Liberty half dollar features Miss Liberty striding across the obverse portrait and an eagle perched on a mountaintop. Walking Liberty half dollars were made from 1916 through 1947, with those made since 1934 generally the most affordable. Prices range from $7 to $15 for a basic circulated specimen of a common date. Kennedy half dollar – The Kennedy half dollar was first struck in early 1964, just weeks after President John F. Kennedy was assassinated in Dallas, Texas, on November 22, 1963. The Kennedy half dollar is perhaps one of the most beloved modern U.S. silver coins, in no small part due to its obverse subject, a president who today is regarded as one of nation's greatest. Silver Kennedy half dollars can be bought for less than $10 each; circulated copper-nickel clad Kennedy halves can be obtained for face value from banks and other financial institutions. Morgan dollar – One of the most popular United States silver dollars ever minted was the Morgan dollar. Originally known as the Liberty Head dollar, it was designed by George T. Morgan and was struck from 1878 through 1904, and once more in 1921. Morgan dollars are often collected among world coin collectors as a "crown" because it is similar in size (38.1 millimeters in diameter) and weight (26.73 grams) to traditional British crowns, which traditionally measure at 38.6 millimeter in diameter and weigh 27.28 grams, or one ounce. Silver dollar prices vary with the fluctuations of the bullion market, but circulated, common-date specimens are usually obtainable for less than $30. Pursuing one example of all of the coins mentioned above would set the collector back by around $100 to $200, depending on the dates and grades of the coins bought; buying higher-grade examples or rare dates would, expectedly, make such a set cost much more than $200 to assemble. Whether bought by a beginning collector or a more seasoned hobbyist, this silver coin collection is ideal for an array of budgets and collectors with a wide variety of numismatic tastes.